The Eysenck Personality Questionnaire is based on tried and tested principles, the result of research by renowned Professor of human psychology, Hans Eysenck, and described in his popular book 'Know Your Own Personality' published first in 1972. He had a clear understanding of how introversion and extroversion, combined with the degree of emotional stability and self-determinism, determine the personality traits that result in much of an individual's behavior. Eysenck's theory is based primarily on physiology and genetics. Although he was a behaviorist who considered learned habits of great importance, he considers personality differences as growing out of our genetic inheritance. He is, therefore, primarily interested in what is usually called temperament. Temperament is that aspect of our personalities that is genetically based, inborn, there from birth or even before. That does not mean that a temperament theory says we don't also have aspects of our personality that are learned, it's just that Eysenck focused on "nature," and left "nurture" to other theorists. Extroversion is characterized by being outgoing, talkative, high on positive affect (feeling good), and in need of external stimulation. According to Eysenck's arousal theory of extroversion, there is an optimal level of cortical arousal, and performance deteriorates as one becomes more or less aroused than this optimal level. Arousal can be measured by skin conductance, brain waves or sweating. At very low and very high levels of arousal, performance is low, but at a more optimal mid-level of arousal, performance is maximized. Extroverts, according to Eysenck's theory, are chronically under-aroused and bored and are therefore in need of external stimulation to bring them up to an optimal level of performance. Introverts, on the other hand, are chronically over-aroused and jittery and are therefore in need of peace and quiet to bring them up to an optimal level of performance. Neuroticism or emotionality is characterized by high levels of negative affect such as depression and anxiety. Neuroticism, according to Eysenck's theory, is based on activation thresholds in the sympathetic nervous system or visceral brain. This is the part of the brain that is responsible for the fight-or-flight response in the face of danger. Activation can be measured by heart rate, blood pressure, cold hands, sweating and muscular tension (especially in the forehead). Neurotic people, who have low activation thresholds, and unable to inhibit or control their emotional reactions, experience negative affect (fight-or-flight) in the face of very minor stressors - they are easily nervous or upset. Emotionally stable people, who have high activation thresholds and good emotional control, experience negative affect only in the face of very major stressors - they are calm and collected under pressure. 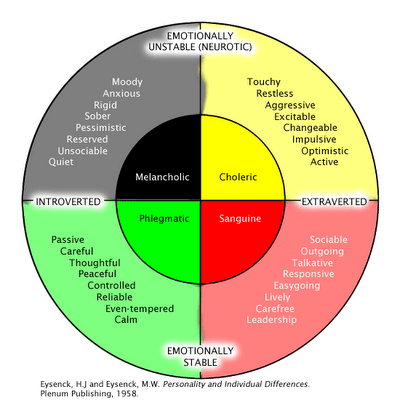 unstable introverts (melancholic qualities such as - quiet, reserved, pessimistic, sober, rigid, anxious, moody). Psychoticism is associated not only with the liability to have a psychotic episode (or break with reality), but also with aggression. Psychotic behavior is rooted in the characteristics of toughmindedness, non-conformity, inconsideration, recklessness, hostility, anger and impulsiveness. The physiological basis suggested by Eysenck for psychoticism is testosterone, with higher levels of psychoticism associated with higher levels of testosterone. The further Categories included in the questionnaire are not fundamental temperaments but during the exhaustive testing of personality that Eysenck conducted, he also looked into the areas of Sexuality and Political attitudes that of course play a major part in our lives, and determined norms of behavior and viewpoint with his usual statistical thoroughness. 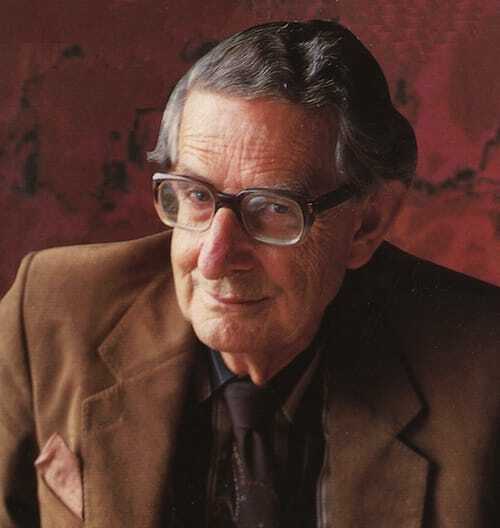 Hans Eysenck was born in Germany on March 4, 1916. His parents were actors who divorced when he was only two, and so Hans was raised by his grandmother. He left there when he was 18 years old, when the Nazis came to power. As an active Jewish sympathizer, his life was in danger. In England, he continued his education, and received his Ph.D. in Psychology from the University of London in 1940. During World War II, he served as a psychologist at an emergency hospital, where he did research on the reliability of psychiatric diagnoses. The results led him to a life-long antagonism to main-stream clinical psychology. After the war, he taught at the University of London, as well as serving as the director of the psychology department of the Institute of Psychiatry, associated with Bethlehem Royal Hospital. He has written 75 books and some 700 articles, making him one of the most prolific writers in psychology. Eysenck retired in 1983 and continued to write until his death on September 4, 1997. Eysenck's theory remains influential; before his death in 1997, he was the most cited living psychologist, and he is the third most cited psychologist of all time, after Freud and Piaget. Also available to download in Word format. This personality test, which is based on the well-proven Eysenck Personality Questionnaire, provides the tools for a wide-ranging analysis of your personality, so you can know yourself better. Covering the areas of Introversion/extroversion, Emotional Stability, Determinism, Sexuality and Social & Political Attitudes, it will help you see yourself - your mental, emotional and behavioral strengths and weaknesses - in a more objective light. It is an ideal starting point for personal development.